In New Zealand, with crop volumes growing every year, our potato storage needs to keep up with the latest advice and improvements. Storage is a crucial part of production and if carried out poorly can have disastrous consequences. Worst case scenario means damage, spoilage and rot. Done well, storage means good traceability for any unexpected biosecurity issues, disease screening, quality tubers, happy processors and overseas receivers. To assist our industry, we can look to the UK’s advice from AHDB and at our August conference, we will hold a special session on storage, with international and domestic advice from guest speakers. Ventilation is the fundamental aspect of potato storage, helping to dry and cool the crop when it is brought into store and remove respiration heat throughout the desired storage period. A well-designed potato store will have positive and uniform airflow, ensuring there are no hotspots which can lead to condensation build-up and increased risk of bacterial or fungal tuber disease and sprouting. Good airflow is easiest to achieve in bulk stores, as they are mostly ventilated under the stack. Air distribution is trickier in box stores. In fact, recent research has identified that in the poorest performing overhead throw systems, as little as 15% of the air discharged over the crop makes it to the end of the building. This because the delivery and return air will always take the path of least resistance, creating shortcuts and a subsequent failure to ventilate the store evenly. Advances in computer fluid dynamics (CFD) modelling can help farmers design new stores as well as upgrade existing ones to improve airflow. For box stores, farmers are urged to invest in a divider curtain or plenum to separate delivery and return air. This alone has been shown to provide at least a twofold increase in air reaching the far end of the store. 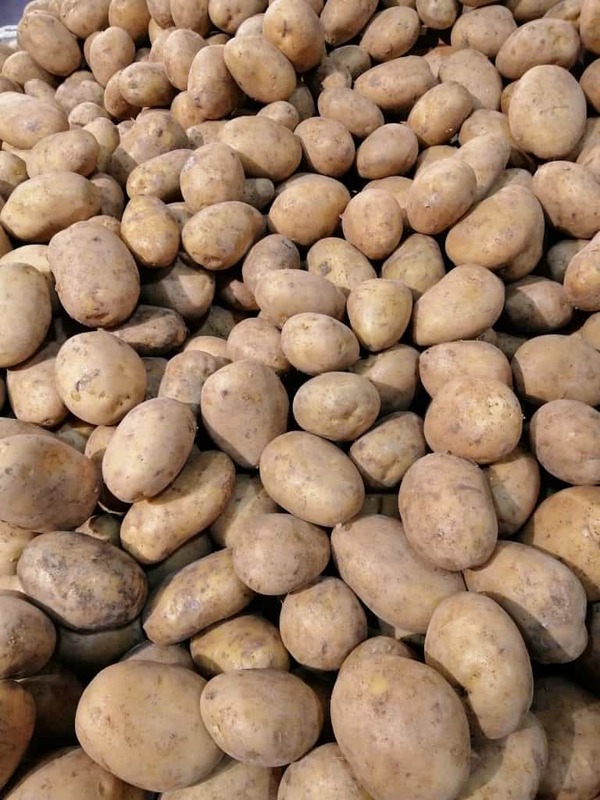 Air leakage has been identified as a major problem in commercial stores and can scupper the aim of potato storage – to create a controlled environment that keeps tubers in optimum saleable condition. Leakage from wind-induced ventilation leads to loss of control of the store environment and possible problems include condensation and sprouting. Combatting these issues through extra ventilation or refrigeration, without fixing the source of the problem, leads to increased running costs and higher tuber weight loss. A leakage test for stores has been developed, which uses fans to subject the building to a pressure differential of 50 pascals. An AP50 value is generated, expressed in cubic metres of air lost per hour per square metre of building. An acceptable standard for brand new buildings is ≤3cu m/h/sq m. Older buildings, even if well maintained, are unlikely to achieve this, so ≤10 cu m/h/sq m is a more realistic target. In a recently completed project, Sutton Bridge researcher Glyn Harper has revisited work carried out in the 1950s on respiration rates in store, where the living tubers use sugars to respire, using oxygen and releasing carbon dioxide and heat. The old data gave a snapshot in time, but his new research aimed to monitor respiration rates over long-term storage periods and it was found that respiration rates stabilised, particularly at lower temperatures. For store managers, this means that after the initial curing and temperature pull down, longer-term stored crops might not need the same level of ventilation as first thought, leading to potential efficiency and energy savings. There is increased importance in improving management and control of stores in order to apply suppressants correctly and evenly for maximum efficacy and lower residues. It’s worth taking steps to minimise the need for sprout, such as growing varieties with long tuber dormancy and low-temperature tolerance (for example VR808 and Russet Burbank). That’s because lower temperatures can reduce sprouting, but can lead to quality issues in less tolerant varieties. Where feasible, varieties should also be segregated by inherent dormancy into different stores, ensuring that only the tubers requiring sprout suppression are treated. One key factor for store managers is to correctly identify the wide range of storage diseases and defects seen on tubers. Blemishes and disease affect saleability of potatoes for the fresh market. Warm and damp conditions encourage disease spread in store, so keeping temperature cool and minimising condensation will reduce the risk of exacerbating the problem. Some disease doesn’t necessarily spread in store, but can worsen on the surface of affected tubers. Rapid pull-down to the target storage temperature will help slow development of disease.